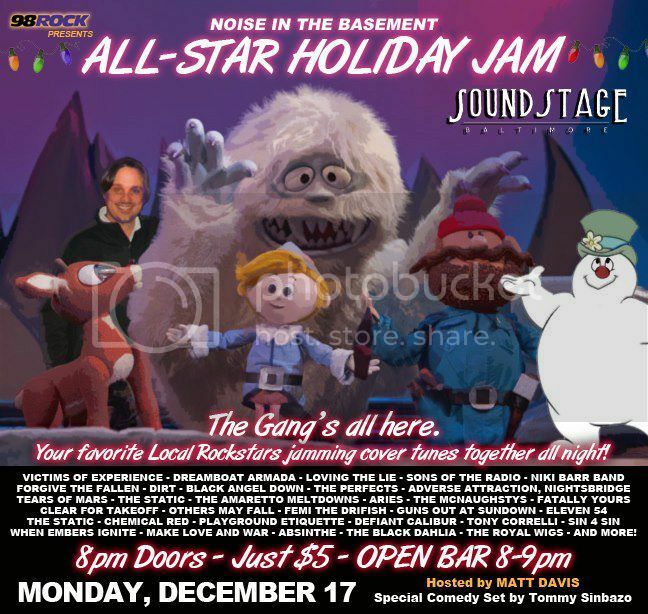 Tonight Femi TheDriFish will be playing 98 Rock Noise in the Basement Allstar Jam - Holiday 2012 Edition at the Baltimore SoundStage. He will be performing two covers live with the band, FLOTBOTS & Cage the Elephants cover. The Holiday Jam! SPREAD the word FEMI The DriFish is coming !! Proceeds to benefit the St. Jude's Foundation - Finding Cures, Saving Children. Yeah, they're doing it for the kids! They're bringing you music from some of your favorite local rockstars. Yeah, this jam is chock-full of juicy goodness featuring crazy collaborations, holiday tunes, and some amazing finale numbers. So come grab some beverages and get your Depends ready, cause once the show starts, you're not gonna wanna break for the potty.